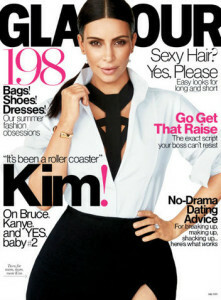 Kim Kardashian discusses her second pregnancy in the Newest issue of Glamour. It’s a big week for the Kardashian- Jenner family! One day before Vanity Fair introduced Caitlyn Jenner to the world; a clip of what is to come on Keeping up with the Kardashians revealed that Kim Kardashian is expecting her second child with husband Kanye West. The pregnancy news comes after months of fertility struggles and a lot of trying on Kim and Kanye’s part. Kim’s efforts to get pregnant have been well documented this season of KUWTK. Kim stated that she and Kanye were trying to get pregnant about “500 times a day” and Kanye previously said he was doing everything he could to have another baby with Kim. She started in vitro fertilization and rumors were starting to circulate they they were considering surrogacy. The most recent episode even ended with Kim stating that she was “so over” the process. The process must have paid off though because in the preview for the second half of the season, Kim is seen telling Khloe “I just got the blood test back and I am pregnant!” After the announcement, momager Kris Jenner and Kardashian’s best friend Jonathan Cheban congratulated Kim and Kanye on Twitter. However, the rest of the family stayed pretty quiet on Social Media (maybe preparing for the reveal of Caitlyn?). Kim did discuss the pregnancy new in a cover story for Glamour, which hit newsstands today. Kim stated that she a Kanye were “so beyond excited” to be having a second baby. Kim and Kanye are already parents to daughter North West, who will turn two on June 15. The announcement of their impending bundle of joy led many to joke that the new baby should be named South West. The couple just recently celebrated their one-year wedding anniversary on May 24. Do you think Kanye and Kim will have a boy or a girl this time? Do you think they should name their child South? Let us know in the comments below or on Twitter using #glamorouspaper.